There were times that we drove for hours on quiet highways with little traffic and nothing but grand views to enjoy. We would take a break every couple of hours then stop for lunch, often on a pull out that offered a mountain view. This was a nice warm summer day that was fairly light in smoke from area fires during this busy fire season. We made a mid-morning stop at the Rancheria Falls Recreation Site, walking along a boardwalk through the boreal or Northern forest, which lies just south of the tree line across Canada. It takes at least three times longer for a forest to reach maturity in the North so the black and white spruce seen in this area are almost 100 years old but not yet fully mature. We made a lunch stop at a big open space at the side of the road next to this pretty spot on the river. We didn’t get to have any fresh fish for lunch but the effort was made and enjoyed. As a BC resident, we had checked the fishing regulations. A visitor’s Yukon fishing license is required and can be purchased at Visitor Centers. We overlooked Taslin Lake as we approached Taslin for a fuel stop and crossed this bridge over Nisutlin Bay. The delta is a National Wildlife Area, which is designated by the federal government and used to protect important habitat for wildlife. The community of Teslin is not large but offers several opportunities to see history at museums and heritage centers. 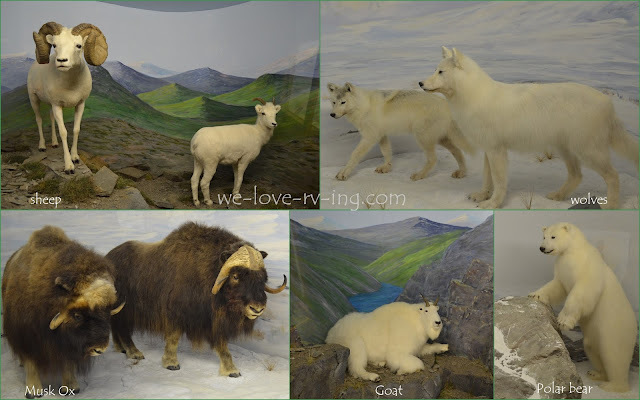 The Yukon Motel Lakeshore Resort displays these fairly realistic animals out front but those in the Wildlife Gallery were very real. These incredible animals were on display behind glass in the Wildlife Gallery with settings that included painted and real props. I do appreciate the calibre of taxidermy this would involve and can enjoy the beauty of these animals from afar. George Johnston was a fascinating man who with a brownie box camera photographed the life of his Tlingit people and left his collection for us all to see in this museum named after him. He was a self- taught photographer and developed his photos in a rustic dark room in a cabin. His photography is displayed in the museum that also has a large collection of Tlingit artifacts. A great place to visit. Just a few kilometres north of town is the Teslin Tlingit Heritage Centre. These five traditional Clan poles were carved by local artists and depict the clans of the Teslin Tlingit Council. While we were there, we enjoyed learning the method used for tanning moose hides from one of the teachers who are passing their skills down to the younger generations. It is wonderful to see that these old traditions will not be forgotten. Our evening hours were spent walking the sunny beaches of Teslin Lake, right below our campground. We watched the small waves of this large lake while the setting sun slowly ends our day at the little town of Teslin that offers a whole lot of wonderful Native culture. A great way to end a great day. Click here to follow us over the Top of the World. We began our day at the Dawson Creek Historical Site where the Alberta Pool Elevator Ltd houses the Visitor Centre for tourist information and a gift shop as well as a museum operated by the South Peace Historical Society. March 1942 was when the first US Army Corps of Engineers arrived here to begin construction of the Alaska Highway. The road was to cover 2450 kilometers (1523 miles) of the northern country from Dawson Creek, BC to Delta Junction, Alaska. This sign replaced the original one that was knocked down in 1946. The true beginning of the Alaska Highway is marked by this Mile 0 sign, another replacement in the late ‘50’s, and is situated in downtown Dawson Creek in the center of an intersection. This small town of 500 at the time the US Army Corp Engineers arrived, soon burst into a town of 10,000 people, many of whom lived in tents in the farmer’s fields. Today’s population is about 12,000. Just north of town there is an Historic Site on the Old Alaska Highway. This road turns off of Hwy 97, also called the Alaska Highway, and which we followed for a short distance to cross the Kiskatinaw Curved Bridge within the Kiskatinaw Provincial Park. This bridge was built in 1942-43 and still stands strong. 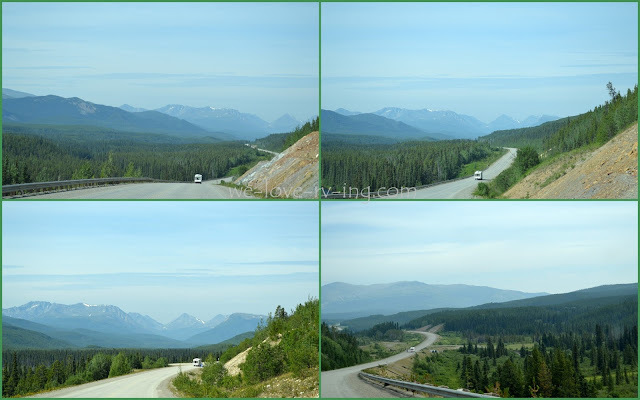 We had some rain to pass through for part of the morning and as we drove through Fort St. John but we later had sunny periods with overcast skies but no rain and were enjoying the green hills and mountains of the Alaska Highway on our way to Fort Nelson, BC. The Peace River Country has some beautiful scenery. After a 6 hour drive from Dawson Creek, we arrived in Fort Nelson with blue skies and sunshine to enjoy. 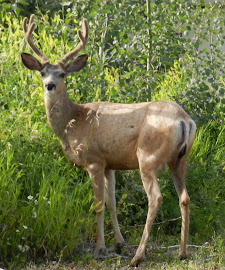 We stayed on the outskirts of town in the Triple “G” Hideaway RV Park which is at Mile 300 on the Alaska Highway. The park has a gift shop plus a restaurant pub which makes it convenient for us on these travelling days so we don’t have to cook. Nearby the RV park is the Fort Nelson Heritage Museum with lots of interesting old pieces from years past that many of us might remember, if willing to admit that. They also had several taxidermy mounts, which in plain language is stuffed dead animals. If prepared to see them, I am okay but not too close. The museum includes several different transportation collections. There is a car and truck collection that began as a private one and continued to grow once it became part of the museum. There are pieces of equipment from the building of the Alcan Highway, as well. This monument at the Museum, pays tribute to those who built the Alaska Highway, also called the Alcan those many years ago. The rates to see these attractions at the museum is very reasonable, one ticket covers them all. To see more about the museum, click here. We now leave Fort Nelson, BC, also known as the gateway to the Northern Rocky Mountains and continue on the Alcan Highway. It turns out that we were one day ahead of a major forest fire in the area that closed down the Highway for a period of time. 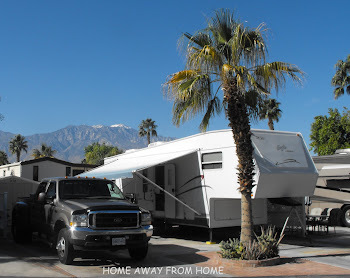 Click here for our next day of travels.